Private (PTE) Joe Foo Wei Rong, a 20-year-old National Serviceman, died during training on Tuesday morning 6.05am while doing chin-ups at Lim Chu Kang Camp. Private Foo was a full-time National Serviceman from the 4th Battalion, Singapore Infantry Regiment. I used to be from the 4th Battalion, Singapore Infantry Regiment (4 SIR) myself during my NS days. Singapore's Energy Market Authority (EMA) announced electricity tariff to go up by 21% from Oct 2008 onwards while Hong Kong CLP Power announced 3% reduction. The Consumers Association of Singapore (CASE) response on the planned 21% electricity tariff hike says it all. CASE advise Singaporeans to use electricity effectively in a bid to manage expenses but made no mention on the timeliness of the hike amid current difficult economic conditions. The Energy Market Authority (EMA) announced average household electricity tariffs from October to December is to go up by 21% in the last quarter of 2008 due to higher fuel oil prices. The below article from ChannelNewsAsia says the government rebates of $310 to $330 will more than cover the increases for these households. I remember the government once said the Growth Dividends distributed is to help offset inflation but that was many months ago. I wonder if the upcoming planned increase will result in nothing left for households. Why give away money but then take it back? Singapore Senior Minister (SM) and current Chairman of Monetary Authority of Singapore (MAS), Mr Goh Chok Tong, recently commented on the now hot Minibonds and High Notes failed investments. "I know (individual) Singaporeans have been hurt; they have invested in Lehman Brothers mini-bonds, in High Notes ... and more have been hurt investing in equities, but that’s life — if you want to have a good rewards, you’ve got to take risk. “Otherwise, leave your money in your CPF ... Four per cent is a fabulous return without risk. Singaporeans complained it was too low, (but) now they know the meaning of a capitalistic existence." In my personal opinion, I thought Mr Goh could have commented in a way whereby the many ordinary retail investors' concerns over their jeopardized huge savings are addressed especially in the current possible mis-selling by the banks. I am disappointed. If you are fascinated by the Ribbon UI offered by Microsoft Office 2007, it is now possible to get it even on Notepad. A freeware, Notepad 2008, is now available for public download. For your information, Microsoft has announced the use of ribbons in its new Notepad packaged in Windows 7.0. Just 3 days after Mozilla released Firefox 3.0.2, version Firefox 3.0.3 is now released. To upgrade to version 3.0.3, select Help from Menu and choose Check for Updates. Manufacturing output for first eight months of 2008 is 2% lower than a year ago with most sectors shrank. August year-on-year output drops 12.2% as compared to a year ago. The Capital Adequacy Ratio (CAR) of insurance companies posted on the Monetary Authority of Singapore (MAS) website shows record for the year 2007. They are outdated. Recently, I sent an email to the MAS to request for a more up-to-date CARs values of insurance companies operating in Singapore, to reflect more genuine liquidity amid the trying year 2008 economic conditions. We have already seen 9 months passed for year 2008 and I feel we as consumers should not be deprived of first-hand key economic ratios. The reply by MAS was disappointing. MAS replied with an assurance that they are glad that insurance companies including AIA reported healthy CARs. I reinforced and highlighted my request for CARs values in my follow-up email. I made clear what I was expecting to obtain from them. MAS replied promptly but was again a total disappointment. Other than assurance, it's just another similar assurance. They never did address my question. Knowing the unwillingness of MAS in disseminating up-to-date information to public, I gave up. I replied and mentioned my disappointment and why I conceded because of MAS in sharing. MAS closed this case and never follow up. MAS seems to be indifferent to my unhappiness. I cannot accept MAS unwillingness to release up-to-date information to public. Singapore claims to aspire to be a regional financial hub, however, with this "attitude", it's no wonder Hong Kong is still way ahead. My personal opinion on the handling by MAS to the recent outcry by ordinary folks who have lost several thousands due to alleged mis-selling of risk adverse investment products by banks is not what I would prefer it to be. MAS leaves the investors to deal with financial institutions directly instead of intervening directly and organizing independent board to address this problem. The Hong Kong Monetary Authority did one step further by direct intervention. I hope more can be done in disseminating information to the public. The current economic condition can be an opportunity for MAS to review its process and workflow. New York's governor said his state will allow AIG, the nation's largest insurer, to use $20 billion from its own insurance subsidiaries to ease a financial crunch. From which subsidiaries is the $20 billion going to be raised? Do not forget AIA Singapore is one of AIG's wholly owned subsidiary. Washington Mutual (WaMu) became the largest casualty and is the 13th U.S. bank to fail this year and the ninth to fail since July. Its customers withdrew a massive US$16.7 billion in cash in the past nine days and this has resulted the largest bank failure in U.S. history. At this point in time, WaMu shares is trading at 15 cents and has dropped more than 93% just today. Last year, its share price was over US$30. JP Morgan has confirmed to have acquired WaMu's assets. JPMorgan became the biggest U.S. bank by deposits with the deal, acquiring WaMu's branch network for $1.9 billion. All eyes are now on Wachovia. Google recently launched Google Moderator. Google Moderator is a small application to submit topics and questions and then vote in favour of or against it. The new Microsoft Office 2007 saves your Document and Spreadsheet in docx and xslx extensions respectively instead of the more popular earlier doc and xls extensions. To open the new formats, we can either use Office 2007 software itself, office viewer, or convert them. Zamzar offers an online file conversion option for FREE. Not only documents formats are provided, other file formats like images, music, videos and compressed formats are supported. Russian security giant Kaspersky Lab recently released a Security Bulletin on Malware Evolution for first half of 2008. It reports on the current trends in malware. It is noticeable that viruses that attack mobile phones is on the uptrend. Just how to stay awake at work? wikiHow has its own advice on staying awake. Every thirty minutes, do "something"
Microsoft confirmed Tuesday that several services currently found within Windows XP and Windows Vista will be dropped for Windows 7, and replaced with similar versions of its Live services. Mozilla recently released Firefox 3.0.2 to fix security issues and layout of certain web pages. To upgrade to version 3.0.2, select Help from Menu and choose Check for Updates. Singapore's August 2008 Consumer Price Index (CPI) rose 0.2% over July 2008. Compared with August 2007, CPI rose 6.4% in August 2008. The consumer price index for the first eight months so far for the year 2008 was 6.9%. It seems like inflation is not easing as much as what many have wished for. I have been hearing FPGA at work several times and I come into a decision to make it a point to study exactly what is FPGA. "A field-programmable gate array is a semiconductor device containing programmable logic components called "logic blocks", and programmable interconnects. Logic blocks can be programmed to perform the function of basic logic gates such as AND, and XOR, or more complex combinational functions such as decoders or mathematical functions. In most FPGAs, the logic blocks also include memory elements, which may be simple flip-flops or more complete blocks of memory." The recent collapsed of investment bank Lehman Brothers and several money losing banks like Merrill Lynch, Morgan Stanley, etc have resulted many losing huge savings invested on so-called "safe" structured investment products promoted by banks' Relationship Managers (RM). These credit linked securities e.g. Minibond, Pinnacle Notes and High Notes are highly sophisticated. One of the most high profile ones is DBS High Notes 5 which is at risk of a zero payout after Lehman Brothers filed for Chapter 11 bankruptcy. I personally prefer investing in those that are more transparent and simple like Stocks and Shares, Unit Trusts and ETFs. I believe these are better managed and simpler. I do not believe in structured investment products whereby there is said to be "guaranteed". I believe nothing is guaranteed when it comes to investment. Stocks and shares with strong fundamentals like the blue chips, well-diversified Unit Trusts portfolio spread, and ETFs are safer and are more likely to grow when invested for long term. Moreover, dividends returned from stocks, UT and ETFs are more transparent. There are already many resentments over the misleading selling of complicated structured investment products that have caused many including senior citizens losing substantial percentage of their retirement savings. In certain degree, I do feel the Relationship Managers are partly at fault but I believe if there is no demand, then there will be no supply. That's how economics works basically - Demand meets Supply. I strongly advise consumers to commit only when they know what they are doing. This tip is applicable not only on investment but also on all things. Once committed, the consumer is deemed to have understood and agreed to all underlying mechanisms. Banks and financial advisers marketing these credit linked securities should present all risks involved. Both sides must do their part. The Wall Street that shaped the financial world for two decades ended last night, when Goldman Sachs Group Inc. and Morgan Stanley concluded there is no future in remaining investment banks now that investors have determined the model is broken. The last two largest investment banks have decided to remove their investment status to receive Federal Reserve approval to become bank holding companies. They will now be able to be protected by the Federal Deposit Insurance Corp (FDIC) deposit insurance. Structured investment products are complicated beyond many including qualified financial advisers. If you were to read the below link on Equity-linked notes (ELN) e.g. Pinnacle Notes. Do you really understand structured products? I am selling Sony DSC-S730 Digital Camera at a S$190. It is BRAND NEW with plastic still sealed! Interested party can call me directly at 9691-1584 or leave a message at one of the below threads. Apple said it will replace power adapters sold with its popular iPhone 3G mobile telephones because of a risk prongs will snap and cause people to be jolted by electricity. Countries affected are US, Japan, Canada, Mexico, and several Latin American countries like Colombia, Ecuador, El Salvador, Guatemala, Honduras, Peru, Argentina, Chile, Costa Rica and Panama. Credit Default Swaps - The Next Crisis? What is Credit Default Swaps? A credit default swap (CDS) is a credit derivative contract between two counterparties, whereby the "buyer" or "fixed rate payer" pays periodic payments to the "seller" or "floating rate payer" in exchange for the right to a payoff if there is a default or "credit event" in respect of a third party or "reference entity". If a credit event occurs, the typical contract either settles by delivery by the buyer to the seller of a (usually defaulted) debt obligation of the reference entity against a payment by the seller of the par value ("physical settlement") or the seller pays the buyer the difference between the par value and the market price of a specified debt obligation, typically determined in an auction ("cash settlement"). A credit default swap resembles an insurance policy, as it can be used by a debt holder to hedge, or insure against a default under the debt instrument. However, because there is no requirement to actually hold any asset or suffer a loss, a credit default swap can also be used for speculative purposes and is not generally considered insurance for regulatory purposes. Credit Default Swaps: The Next Crisis? U.S. biggest insurer, American International Group (AIG), recently bailed out by the Federal Reserve, incurred billions dollars of losses due to Credit Default Swaps. An article written on Mar 2008 by time.com wrote a possibility of CDS to be the next financial crisis. It documents the relationship between Credit Default Swaps (CDS) and Collateralized Debt Obligations (CDOs) and how huge and "explosive" CDS has become. Washington, D.C., Sept. 19, 2008 — The Securities and Exchange Commission, acting in concert with the U.K. Financial Services Authority, took temporary emergency action to prohibit short selling in financial companies to protect the integrity and quality of the securities market and strengthen investor confidence. The U.K. FSA took similar action yesterday. Google Inc extended an already wide lead in the U.S. Web search to 63.0 percent share of the market in August, its biggest monthly gain in five months, a report said on Thursday. Yahoo Inc, the No. 2 player in the U.S. Web search market saw its share of the business drop 0.9 percent to 19.6 from July while Microsoft, the No. 3 U.S. player, slipped 0.6 percent to 8.3 percent, according to comScore Inc. Drivers and stubs are both white-box testing techniques but functions essentially opposite of each other. Drivers are tools used to control and operate the software being tested. Stubs receive or respond to data that the software sends. Google co-founder, Sergey Brin, launches his personal blog. From his blog, Brin mentioned he has gene mutation linked to Parkinson's disease. "Welcome to my personal blog. While Google is a play on googol, too is a play on the much smaller number - two. It also means "in addition", as this blog reflects my life outside of work." Below is a list of Capital Adequacy Ratio (CAR) of some of the more well-known (at least those I know of) insurance companies operating in Singapore. The values are based on year 2007 data provided by the respective insurance companies to Monetary Authority of Singapore (MAS). Above extracted from MAS site. SOME local investors of a product linked to bankrupt investment giant Lehman Brothers have received late-night phone calls from DBS Bank warning them that their entire stake may be wiped out. The investors have their cash in a product called DBS High Notes 5 that the bank offered wealthier clients last year. It came with a promised annual return of about 5 per cent. But Lehman's collapse on Monday means the product will be unwound and investors may only get a portion of their investment back - or none at all. One 52-year-old customer told The Straits Times: 'I received a call from my relationship manager late Tuesday night. He told me that...my investment may amount to zero.' The man had invested $50,000 - savings he had earmarked for retirement. A customer in her late 40s said: 'My relationship manager called and told me to be prepared to receive a letter from the bank...[it] would say something to the effect that my investments in products like High Notes 5 may be totally gone.' She invested $50,000 and US$30,000 (S$43,000) in two separate transactions. Investors are mostly clients of DBS's priority banking unit, DBS Treasures. The product - DBS High Notes 5 - is a 5-1/2 year structured product linked to eight underlying shares, including Goldman Sachs, Morgan Stanley, Merrill Lynch, Macquarie Bank and Lehman. Customers who invested in Notes 5 said they were sold on the relatively high 5 per cent annual payout by DBS. But now they just want their money back. 'What we do not understand is: How can the fall of one bank cause our funds to just vanish when there are seven other stocks within the product that are still trading?' said a man whose elderly aunt invested $50,000 in DBS High Notes 5. According to a person familiar with the matter, the largest single investment made on High Notes 5 was $2 million, although this could not be verified by DBS. DBS confirmed that it took immediate action to notify customers once it learned of Lehman's chapter 11 bankruptcy filing. DBS said the Lehman collapse has triggered a 'credit event' and the bank called for a redemption of the notes on Monday. It said unwinding of the product has begun and it will be at least 30 business days before clients learn of the final payout. But DBS also confirmed that investors in High Notes 5 may - 'in the worst-case scenario' - not get back their entire principal amount invested. The product's prospectus also indicated that in a credit event such as bankruptcy, the notes 'will be terminated and the investor will receive zero payout'. The bank said the product does not contain a guarantee that the principal will be protected. It also told The Straits Times it would 'fully investigate' claims by some customers that High Notes 5 was in fact sold on such a promise. Meanwhile, UOB and OCBC Bank said that though some customers have invested in Lehman-linked products, the volume was 'modest' and 'negligible'. 'Since news of Lehman filing for Chapter 11 broke, we have taken a proactive approach in updating clients on the latest developments,' said UOB's spokesman. OCBC's spokesman said in an e-mail that its securities unit has advised customers to wait for updates from Lehman. It is always the fine print by the banks that confuse gullible investors. AIA's US parent AIG Inc was extended a lifeline by the Federal Reserve, a loan of US$85 billion for a 24-month term. In return, the Fed will own 79.9 per cent of the ailing insurance giant. But it is clear that AIG must sell assets to repay the very high interest loan. AIG has the best Asian insurance franchise in life and general insurance of any Western company. Companies named as possible buyers of AIG assets include Prudential, Munich Re and Allianz SE. So, are we really seeing the fall of AIA? Following the near collapse and bailout of insurance giant American International Group Inc, Kraft Foods Inc replaced AIG in the Dow Jones Industrial Average index. On 18 Sep 2008, the Straits Times Index (STI) ended at 2,419.21 points, down 0.08 points after more than 4% fall when market first opened. After lunch fight-back route to recovery was remarkable and almost unbelievable. Even Morgan Stanley and Goldman Sachs, the two last titans left standing on Wall Street, are no longer immune. Morgan Stanley, whose stock fell almost 25 percent, was considering a merger with Wachovia or another bank to help shore up its finances. Goldman Sachs' stock fell almost 14 percent, and the firm had to rebuff rumors that it was seeking a capital infusion. Just where is the bottom? Nobody knows. What is Capital Adequacy Ratio (CAR)? Capital adequacy ratio (CAR), also called Capital to Risk (Weighted) Assets Ratio (CRAR), is a ratio of a bank's capital to its risk. National regulators track a bank's CAR to ensure that it can absorb a reasonable amount of loss. CAR set by the Monetary Authority of Singapore (MAS) set on insurance companies operating in Singapore is at 120%. Why AIG Just Cannot Fail? AIG is already on the verge of bankruptcy and yet am now facing rent payments after Lehman bankruptcy. Situation looks rather bleak! New York Governor David Paterson today said struggling insurance giant AIG had one day to raise up to $US80 billion ($100.45 billion) to stave off bankruptcy. With regards to doubts if money with AIA is safe after its parent, AIG, financial instability, the Monetary Authority of Singapore (MAS) confirms they are safe. I have no comments on their statement. American International Group Inc.'s ratings cut drove the cost of default protection on Wall Street banks to a record on speculation the insurer needs more cash to back $441 billion of credit derivatives. If AIG spirals in the same way as Lehman, the ramifications will be much more substantial. Yesterday, Merrill Lynch agreed to selling itself to Bank of America at US$50 billion. This is around US$29 per share. Should Singapore's Temasek Holdings were to sell off all its 13% to 14% shares on Merrill Lynch to Bank of America, Temasek is set to benefit around 1.5 billion. Temasek's average share price on Merrill Lynch is around US$23 to US$24. Merrill Lynch rose sharply after Bank of America rescue. Merrill Lynch is currently trading at US$20.24, up US$3.19 or 18.68%. Merrill Lynch has earlier agreed upon a US$29-share all-stock proposal. Lehman Brothers Holdings free fall down 95.62% or -US$3.49 to trade at merely US$0.16 currently after the once 4th biggest investment bank filed for bankruptcy. AIG shares dived very sharply today with concerns over its balance sheets. At this point in time, AIG is trading at US$4.16 (down -US$7.98 or -65.73%). They are under extreme pressure to raise fresh capitals to try to reassure investors' confidence and stop shares sell-off. American International Group Inc (AIG) recent shares sell-off has sparked AIG to launch a survival plan to avoid credit ratings downgrade. AIG, whose shares dipped double figures for the past 2 days, is pulling together a survival plan that includes selling off some of its most valuable assets, raising more capital and going to the Federal Reserve for help, people familiar with the situation said. AIA has a separate policyholder's fund covering its liability to its policyholders in Singapore. Even if this fund is in trouble, there is a Policyholder's Guarantee Fund managed by MAS that can take care of most of the liability (maybe 90% or more). Lehman Bros, Merrill Lynch, then AIG Down? I wonder what Temasek Holdings has to say for a possible sell off of Merrill Lynch to Bank of America? Will this affect Temasek's ownership on Merrill Lynch? The Dow Jones Industrial Average is currently down 287.49 points (-2.52%). Stocks set to plunge after fall of Lehman Bros. I will be having my Project Retreat from 15 to 17 Sep at Pasir Ris chalet. Working hours will be from 8am to 11pm EVERYDAY. It's going to be tiring. After adding features dealing with Labels, Gmail Labs added 3 more but this time they deal with Reply. Like before, you will need to Enable them before you can use it. I managed to do a sell-contra on a stock and was really lucky to be able to do that! The 10 lots I transacted were the only shares exchanged until 3pm before more queued for buy and sell. My selling price was the highest price for today and very likely only 10 lots were transacted at that price. I usually don't do contra trading but was made to do so after seeing an opportunity to recover some losses incurred for shares I hold for the same stock. It is manageable now. Human Factor: How Long is Too Long to Users? Traditional human-factor guidelines indicate that 0.1 second is about the limit for users to feel that the system is reacting instantaneously. One second is about the limit for a user's flow of thought to stay uninterrupted. Ten seconds is the maximum response time before a user loses interest. However, nowadays users are "trained" to endure longer waiting time by the extensive use of modern AJAX methods to fetch and reload parts of a page in a as-need basis without the need to refresh the entire page. It is important to bear in mind that we should design website to aim for shorter response time. Singapore Press Holdings (SPH), Singapore Exchange (SGX) and FTSE Group (FTSE) announced today the results of the first review of the Straits Times Index (STI) and FTSE ST Index Series. In the STI, Golden Agri-Resources and Jardine Matheson Holdings will be included in place of Thai Beverage PCL and Yangzijiang Shipbuilding Holdings. The integration between Google Reader and Blogger Who's Following You feature is very very buggy. "Followed" blogs displayed on Dashboard do not tally with what I see after I click on "Manage" button. It seems to be more relevant if you previously added non-blogspot blogs. I have reported to Google and see if they can do anything. Just a couple of days ago, I realized Blogger does not allow you to "follow" blogs other than those from Blogspot. Now, I have successfully managed to add blogs from WordPress, Live Journal and Friendster. As long as they are RSS feed enabled, it shouldn't be a problem. 1. NO to academic projects! I deemed taking up academic projects to "help" students to be UNETHICAL. I received an SMS from an ex-colleague whether I am interested to take up a freelance project. I was told the project is for a student. I replied a firm NO without much hesitation. Based on the price-to-earnings ratio, stocks have actually become more expensive even as share prices have come tumbling down. In fact, the P/E ratio for the Standard & Poor’s 500-stock index, based on earnings over the previous four quarters, has risen to just over 24 from around 19, according to S.& P.
Gmail Labs just released 3 new experimental features, all of which are deal with Labels. From Settings page, click on Labs. Enable whichever features you fancy. I have been seeing dismal reports on the semi-conductor industry and so decided to pick a renowned company from that industry for a small little analysis. I picked Chartered Semiconductor Manufacturing Ltd for its global recognition and standing. By the way, they have announced to release 3Q 2008 Mid-Quarter update press release on Sep 10, 2008, Singapore time. Chartered is publicly listed on both NASDAQ and SGX (Nasdaq: CHRT, SGX-ST: CHARTERED). 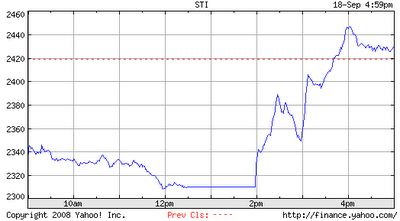 Chartered closed at S$0.395 on SGX on 9 Sep 2008, down 1.3% from previous trading day. 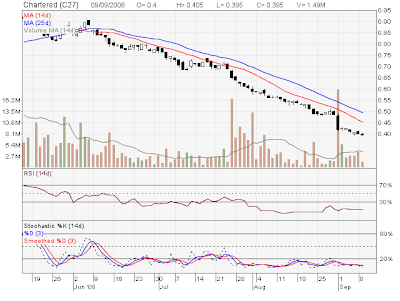 Currently, Chartered is still trading on Nasdaq and is now at US$2.68, down 2.55%. Technical analysis chart for Chartered is as below. Notice the Moving Average is moving in only 1 direction - DOWN. MA 14 and MA 25 are used in this illustration and it seems there won't be any rebound at least for short-term. The RSI tells it all - capitalization on this stock is on its way down. Google's Blogger has recently rolled out a new feature to show who are followers of your blog. After doing some experiment on this new feature, it seems like only blogs from Blogger and those with Blogs Feed enabled can be "followed". I have won myself a talking pedometer in a contest, held on Facebook, for predicting 5th Sep 2008 closing value of the U.S. Dow Jones Industrial Average index. My guess was the closest and thus landed me the prize. My prediction was made before Tuesday, 4 days before market closed for the week. I posted the most bearish guess citing pending jobless claims and employment situation to be reported towards end of the week to support my prediction. No technical charting whatsoever methods were used. Here are some of Google Chrome keyboard shortcuts. Ctrl+B toggles the bookmarks bar on and off. Shift+Escape opens Google Chrome's Task Manager. Ctrl+L or Atl+D to move your cursor to the address bar. Ctrl+K or Ctrl+E moves your cursor to the address bar to enter a Google search. Ctrl+T opens a new tab. Ctrl+N opens a new window. Ctrl+Shift+T opens the last closed tab. Ctrl+Shift+N opens a new windows in "Incognito Mode." Ctrl+Tab cycles through open tabs; Ctrl+Shift+Tab reverse cycles through open tabs. Ctrl+J opens the Downloads tab. Ctrl+W or Ctrl+F4 closes the current tab. Ctrl+R, Ctrl+F5 or F5 refreshes the current page. Ctrl+H opens the History tab. Ctrl+1 through 9 switches to a particular open tab position. Ctrl++, Ctrl--, Ctrl+0 Enlarges, reduces, and restores default text sizes, respectively. Uncheck "Proxy settings" and in the address setting add 127.0.0.1 and in the port 8118. If you have the option, you can also check off "Bypass proxy for local settings"
Click "Ok", close chrome and restart it. Apart from using Privoxy, there is another method which is to mess with the hosts file. On 7 Sep 2008, Google marks its 10th year since incorporated. Today, Google has become a giant and its influence to cyberspace is going to grow for sure. I recently sent an email to a just-listed company on the Singapore Exchange, Hai Leck Holdings Limited, to let them know the importance of connecting to shareholders. Unlike other companies, Hai Leck website does not have an Investor Relations section. Investor Relations page typically includes information like the management, organization structure, announcements, and so on. Other than suggesting to them to add a Investor Relations section, I also reported a bug. In their Contacts page, the link to Email address was erroneous. The erroneous link was corrected 1 day after my email. I am yet to see them adding the Investor Relations page. I hope the Singapore Exchange will enforce all listed companies to be more transparent and connect "better" with shareholders by having a Investor Relations page on their corporate website. The past week saw global stock market taken aback by heavy sell-off amid weak unemployment rates and poor global economy growth. Next week will be equally tough with many upcoming economic data to be released. Google System published an article on some Google Chrome tips that are not so obvious but definitely helpful. Malaysia's ringgit will drop to a 15-month low by the end of 2008 as a widening budget deficit, slowing growth and political turmoil will spur global funds to flee, according to CIMB Investment Bank Bhd. I have compiled a list of about: pages for Google Chrome. If you know of more, do let me know. Navigates to a blank page. This page lists all visited webpages that are cached by Google Chrome. Google Chrome comes with a capability whereby you can browse webpages in Incognito mode. Nothing is cached (kept) and all traces are removed in Incognito mode. It shows how a page will look like if crashed. This shows a list of 10 most frequently visited websites (hostnames). Google Chrome prefetches DNS records to improve page load performance. It shows some text-drawn histograms showing Google Chrome's internal metrics. This can get too technical for many. This is an Easter egg. It embeds the famous 3D pipes screen saver from Windows. If you do not have the 3D pipes screen saver, you won't see it. This page displays a summary of memory consumed by Google Chrome and other known browsers like Microsoft Internet Explorer, Mozilla Firefox and Opera if they are running. You can also get to this page doing a Shift + Esc, followed by clicking on the Stats for nerds link from the Google Chrome Task Manager dialog. This page offers some functionalities to perform I/O tracking and performance monitoring. You will need to start tracking before you navigate to another page in a different tab. This logging display can be technical. This page shows a list of all plugins (e.g. Shockwave Flash and QuickTime) that are available in Google Chrome. These plugins also include those that are disabled. This page displays some internal counters, timers and values used by Google Chrome. These parameters may be of no meaning to some but are certainly very critical since Google titled the page as "Shhh! This page is secret!". This shows the build version of the Google Chrome currently being run. The below is darn funny! The video shows Hitler complaining about Singapore's Electronic Road Pricing (ERP) and the notorious ever-crowded Mass Rapid Transit (MRT) system. How to Increase Google Chrome Omnibox Popup Suggestion Count? By default, the number of popup suggestion count on Google Chrome's Omnibox is only 5. However, we can tweak it to either increase or decrease this count by adding a switch when Google Chrome is run. Google Chrome performs quite well consuming fewer memory resources as compared to Microsoft Internet Explorer and Mozilla Firefox. It is quite light-weight. I like its simplicity, incognito window concept, low memory consumption, individual tabs on separate processes (allow "killing" of tabs without terminating browser), code snippet styling for View Source, Task Manager, etc. Google Chrome is an integration of some of the features from Internet Explorer (including 8.0 Beta), Firefox and Opera. Google officially enters into a Browser war with Mozilla's Firefox and Microsoft's Internet Explorer with their very own Google Chrome. I will be more than eager to try out Google Chrome once it is launched. Singapore Technologies Engineering Ltd (ST Engineering) today announced that its electronics arm, Singapore Technologies Electronics Limited (ST Electronics), has won a S$112m contract from the Land Transport Authority of Singapore (LTA) for the supply of Half Height Platform Screen Doors (HHPSD) and its associated works for all existing elevated Mass Rapid Transit (MRT) stations. Work will commence in September this year and is expected to be completed in 2012. The HHPSD is meant to protect commuters from falling onto the tracks and thus causing lost of lives and disruption in traffic. They will be installed first at the Jurong East, Pasir Ris and Yishun stations in 2009, before they are introduced and completed at all other stations by 2012.